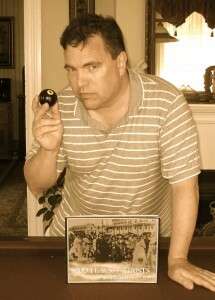 Join Medium and Cape May Ghost Writer Craig McManus, for a spirited Mother’s Day Weekend May 11-12, at The Bacchus Inn. Craig will be hosting two channeling groups on Saturday, exclusively for guests of the Bacchus. May is a wonderful time to enjoy the sites and sounds (without the crowds) at America’s oldest seaside resort, and possibly reconnect with your friends and loved ones on the Other Side. Craig’s Channeling Weekends are an uplifting and wonderful experience. After you arrive on Friday evening, there will be a meet and greet at a local restaurant. On Saturday, Craig will host two group-channeling sessions of ten people each, one in the afternoon, and one in the evening. Craig’s incredible abilities as a medium allow him to reconnect those of us here on the Earth with our loved ones on the Other Side. During teatime, Craig will relate some of his experiences about the ghosts of Cape May, the theme of four books he has written about Cape May’s paranormal side. This will be one of the most unique Mother’s Day weekends you have ever experienced! The price for this weekend event is $50 per person plus whichever room you choose at The Bacchus Inn. You must be staying at The Bacchus Inn and Cottage to participate in this event. Space is limited to twenty guests. Please call The Bacchus Inn to make reservations or for more information at 609-884-2129. For more about Craig, check out his website, www.craigmcmanus.com.